Architectural grade rotationally molded designer polymer resin. Brunello vase planters are UV protected from sun light. Excellent Freeze/Thaw Characteristics. Strength and Beauty, interior or exterior, Brunello vase containers can handle the most inclement weather conditions. Landscape architects, interior designers, contract landscapers, and interiorscapers have the capability to put the classic look of aesthetically appealing planters on rooftop decks, balconies, and other spots where weight is a consideration. Brunello containers have pre-drilled drainage holes to save you time. 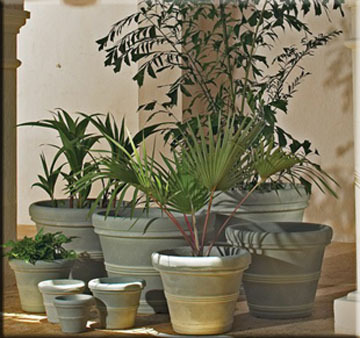 Brunello polymer resin planters are available in 5 "Quick Ship" colors. Caviar Black, Weathered Concrete, Weathered Stone, Rust, and Weathered Terracotta ship within 48 hours. Along with 13 special order colors. Brunello containers are manufactured with polymer type 2 resin and can be recycled. Please note that the 37” and 44” planters are only available in stock in the Weathered Terracotta, but can be special ordered in any of our finishes.